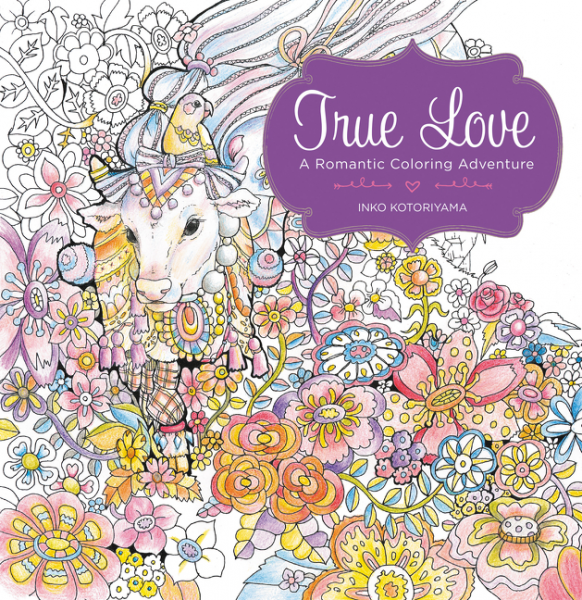 Summary: Color your way through a romantic journey with a cow named Lulu as she searches for her true love. Lulu the cow knows there is a special someone out there waiting for her. With her curious parrot, Nina, at her side, Lulu hits the road to find Mr. Heart—an enchanting adventure filled with strange and wonderful places, unusual new people, and surprising challenges and opportunities. Lulu and Nina must draw out the shy, bashful people who call Hide & Seek Town home, while in Topsy-Turvy Town, they discover a world turned upside-down and backwards. Happy Valentine's Day! I didn't really have a post planned today and then I received a copy of the beautiful coloring book TRUE LOVE: A ROMANTIC COMEDY ADVENTURE by Inko Kotoriyama. This coloring book is an adorable story about a cow named Lulu who is lookin' for love! TRUE LOVE is truly a special coloring book. It has gorgeous detailed black and white illustrations along with a story within its pages. TRUE LOVE begins by showing some ideas about how to use this book. For instance, you can use different art materials as well as differing coloring methods. The book clearly shows how each method (colored pencils, watercolor pencils, and gel pens) would look. For a beginning "colorer" like me, I loved this! The next page introduces the main characters in the story. Lulu, the cow, is the heroine of the story. Nina is a parakeet who travels with Lulu on her romantic adventure, and Mr. Heart is the bull who might or might not be the bull of Nina's dreams! Then the coloring book provides a page titled, "About the Story," which explains Nina's journey to find Mr. Heart as well as the settings for the story. And then the story begins! There are dozens of ornate coloring pages full of animals, flowers, and shapes. The drawings are really beautiful and Lulu is just too cute. In addition, there is text explaining the story or the naming the various settings. A pleasant surprise is that there are five puzzles within the story. For example, there are seek and finds, a maze and spot the differences. It really is a very fun coloring book! If you are looking for a fun gift for Valentine's Day or even Galentine's Day, then look no further than TRUE LOVE! Thanks to the publisher for providing a review copy of this coloring book. I'm not very good at coloring but I sure do love coloring books. This one looks great!